During the last spring of impending budget cuts, campus leaders regularly invited students, faculty, and staff to “keep telling our story,” often by sharing official university publications with others via social media. This was a communication solution to a political problem. Ultimately the audience for our story was not only the institution, its community, and the people of the state, but the powers that be, i.e., the Republicans in control of state government. The real desired effect from this outpouring of narration was to lessen the budget pain to be meted out by the legislature. By hearing our story, they might be persuaded of our value and spare us some of the inevitable trauma. The story we were encouraged to tell came from University Relations, which produces promotional news items, videos, and other uplifting UWM content. The campus also tells it story in advertisements, such as the one I often heard last spring claiming that UWM has 28,000 students with an “entrepreneurial spirit.” Many of the videos in the IAMUWM YouTube series, which are around a minute long, center on individual undergraduates, like the gay mechanical engineering major from Brazil who says, ”I feel like I can do anything,” and the psychology major who conquered her fear of flying with the help of a professor. These videos often tell stories of inspiring life choices and goals, some with tenuous links to academic achievement. Much of this PR is obviously directed at prospective freshmen and their parents, whose tuition dollars (many of them borrowed) are essential for our continued existence now that at least four-fifths of our expenditures are tuition-funded. The campus twitter feed also aims at both current and prospective students, with its regular retweets of new students like this one expressing their excitement over attending UWM. My acceptance letter came from @UWM today! Words can't describe how excited I am to be a panther next fall! 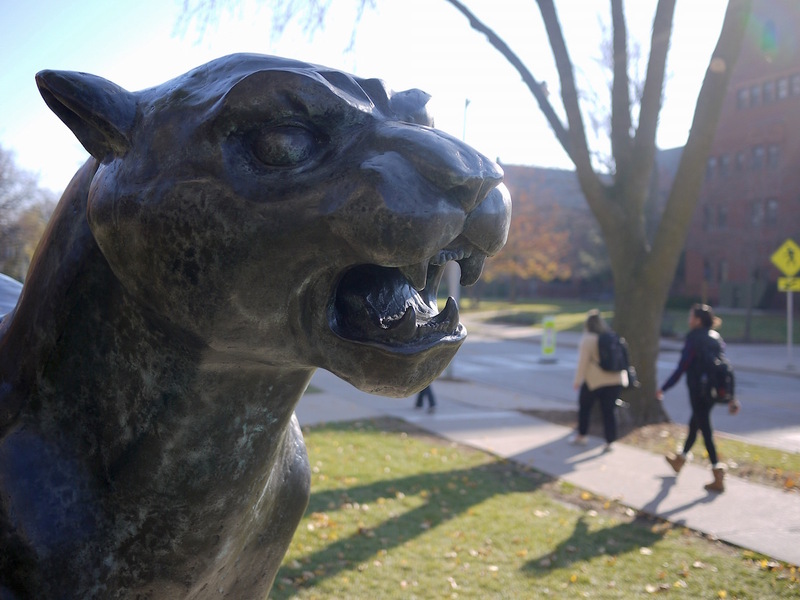 The new panther statue in front of Enderis Hall is all about making the campus a fun place for undergrads. Everyone will want a selfie with the panther. All of this is telling our story: that we’re an exciting place to go to school, but also that we can train you for a job (engineering, or whatever), or open your eyes to new horizons. Lately, campus leaders have introduced another phrase employed in crisis management and downsizing: “investing in growth areas.” When the painful cuts to come are addressed during meetings and presentations, we are told that we will not only be cutting, we will also be strategically investing in growth areas. (Especially the ones that lead to new revenue streams, which are the holy grail of administration at the moment.) Investing in growth areas will also become our story, when we find out which areas are to be so blessed with investment. (Perhaps the cuts that “investing in growth” distract from will also figure into our story somehow.) Growth areas will be identified by a market logic: what will bring in revenue, what will yield return on investment, what will keep us out of the red. We’re not talking about growth of intellect, growth of citizenship, growth of community ties or commitment to social justice. Criteria of value will be economic even if they are also curricular. As a scholar and critic of the narratives of popular culture (this is my “story”) it strikes me that “telling our story” is an endeavor quite central to traditions of humanistic inquiry. Narrative is a topic of interest to a wide array of interdisciplinary scholars from English and media studies to psychology and medicine. But its reputation is squarely as a liberal arts concern. Will storytelling, and the liberal arts more generally, be among our growth areas? It could depend on which story we are interested in telling. Michael Newman is an Associate Professor in the Department of Journalism, Advertising and Media Studies and an executive committee member of the UWM AAUP chapter.